In the north London borough of Camden, a group of residents appealed to the council to be involved in the process of redeveloping their homes. Commissioned by Camden Council, The Glass-House delivered a programme of design training to prepare and upskill residents for the design and planning process that lay ahead. In 2010, Camden Council approved a number of sites for regeneration in the Gospel Oak neighbourhood, as part of a 15-year community investment programme. Responding to a proposal to demolish an existing low-rise block and replace it with higher density housing on a small site, the Bacton Low Rise Residents Association (BLRRA) came together to engage in the process and find out how they could be involved. They approached Camden Council about providing design upskilling for their members and recognising the importance of the full involvement and support of residents in the design and planning of the new estate, the council commissioned The Glass-House to deliver design training for tenants. 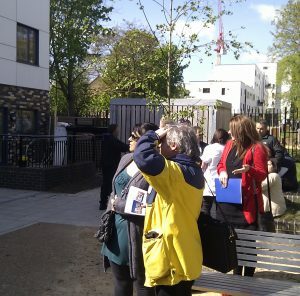 The Glass-House delivered a five-day programme of support, which included a Study Tour of examples of high-density neighbourhood development, including a visit to Glass-House supported project, Granville New Homes in South Kilburn. 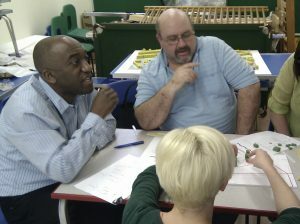 We also delivered design and brief development training, that involved both residents and local authority officers, working together to develop ideas and a shared understanding of the process. This work was supported by Glass-House Enablers and architects, Andrew Dobson and John Burrell. Our support to the project featured in the first episode of Tom Dyckhoff’s The Secret Life of Buildings, broadcast on Channel 4 in 2011. This active and engaged group of residents gained an insight into a range of options and issues involved in the design and construction of their new homes. The training helped the local authority officers to build relationships with residents, while also enhancing their own professional skills. 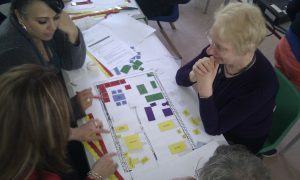 Representatives of BLRRA were on the panel selecting the design team, and felt a well-functioning solution could be found through close involvement with the Design Team and the Council. 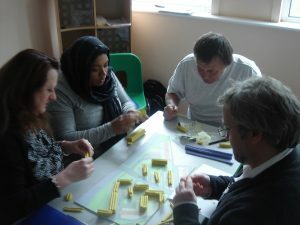 The design team appointed for the project – Karakusevic Carson architects – worked closely with the residents through the whole design and build process and the group helped champion the project and engage the wider community. Residents moved into their new homes in 2016.